Jilly: Cover Question–Which Way Should My Heroine Face? I’m working on the cover design questionnaire for The Seeds of Power (Christal’s book), and I’d appreciate your advice. I know she should be on the cover, but should she face the reader or should we see her back? We’ve been talking a lot about covers lately. The choices are different depending on the sub-genre and the flavor of the book itself. It’s harder than you might think to tempt the reader to take a closer look while also giving them a clear promise of the kind of story you’re offering. For a taste of the challenges involved, click here to read more about covers for Jeanne’s complex, brain-teasing demon paranormal series; here for Kay’s attempts to update the cover of her Las Vegas contemporary caper; here for Justine’s historical suspenseful adventure and here for Nancy’s historical elegant battle of wits. My books are epic fantasy romance, so they have to look historical but with a legendary-adventure kind of feel. They are predominantly romance, and the primary character is the heroine. So I know there will be castles and horses and Princess Bride-type stuff in the background. I’m clear that I want a person (the heroine) on the cover, if I can make that work given the challenges of working with stock photography. If we see the heroine’s back, she is actively moving toward the world I’m depicting (castles, challenges, adventures). Her face won’t be visible to the reader, which means that the other elements of the cover, from her clothing to the setting, will have to tell more of the story. It asks the reader to work harder, but allows them to create their own vision of the character. If the heroine is looking outward, she’s framed by the world surrounding her but she’s making eye contact with the reader. She becomes the most important element of the cover, but she may annoy a reader who has a different vision of the character’s appearance. My current thinking is that having the heroine face the reader offers a different story promise from showing the heroine’s back as she moves toward the setting. I *think* the first suggests the story will focus more strongly on the heroine’s personal journey—her internal challenges and character arc, while the second suggests that the story is principally about her adventures and challenges in the external world and the way she overcomes those challenges. Above I’ve included two covers from Ilona Andrews’ best-selling Kate Daniels series. They’re from the same series with the same main character. Both covers are beautiful. 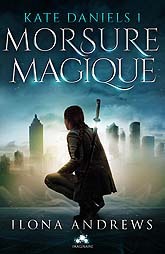 The English language cover has the heroine facing out, the French cover shows her back. Do you think they send different signals about the kind of story inside? It’s a question of nuance, but I think this is an important choice and I’d like to get it clear in my mind. Right now I think I would like my heroine to face the reader, even though it’s likely to prove hugely more challenging in practical terms. What do you say? Do you have a preference? Am I over-thinking this? This entry was posted in Covers, Publishing, Rules and tagged #amwriting, #amwritingfantasy, eight ladies writing, good cover design, Jilly Wood. Bookmark the permalink. I really like the first one – it’s so moody. I’m a big Karen Chance fan, and her covers always have a blonde (correct) with very neat, straight hair (so unlike the character!) – it drives me batty! Sadly, it probably says a lot about her relationship with her publisher – that they’d comission a cover without even reading any of the books. I know, it’s beautiful. That one is by Damonza, the other by their traditional publisher (Ace). There are ten books in the series, and I can only see the first two moody back view covers on the Damonza website. I’ll be interested to see how well they sustain the style for the whole series. I just looked up the Karen Chance covers–totally see what you mean. It happens a lot. Seems to be common in trad publishing that the marketing people create a cover they believe will sell the book and attract new readers. They don’t seem to worry about matching the description of the characters or annoying existing readers. This may also be a constraint of available stock art. I know that’s certainly a problem for historical covers. Particularly if you want something that’s historically accurate (i.e., not just someone wearing a prom dress). I’m sure that’s a big part of it. Of course best-selling–or super-rich–fantasy and UF authors have the option of setting up a custom photo-shoot or hiring an illustrator, but for many (most) authors, especially indies, that’s not an option. To me, if I see the character looking to my left, it seems as though they may be contemplating the past. If I see them looking to my right, it seems as though they are contemplating the future — they are driven by a goal rather than by revenge, say, or trying to uncover a family secret. That’s very interesting, thank you! Must think more about that. What if the character is looking directly at you? Do you have a default response to that, or does it depend upon the particular cover/character? I like seeing people’s faces. I connect a lot more with a face than with an anonymous back. Thanks, Jeanne. The more I think about it, the more I realize that’s true for me, too. Thank you! I think that’s the strong argument for back over the shoulder covers. It’s rare that the face on the cover of a book agrees with my vision of the character. Based on what you’ve told us about the story, the “facing forward” image is the one I’m leaning towards. It says “this story is about me” where the other cover says “we’re going on an adventure”. I’m with Elizabeth on this one. Thanks, ladies! That perfectly sums up the story offer implicit in the two different styles–another nuance I’d never thought about until I had to decide between one and the other. This is the perennial problem of historical/fantasy covers with people on them, as Justine has commented before. Contemporary people look contemporary, and never more so than in this shot. She’s wearing a blazer in an outfit that looks a lot like a pant suit. And her hair looks like a modern coif to me, too. So that’s the problem with those forward-facing models in historical and fantasy covers. Everything you said 🙂 . The historical/fantasy cover problem isn’t an issue for the Ilona Andrews books, because the Kate Daniels series is urban fantasy, not historical fantasy. The setting is post-modern Atlanta, which switches between a technology-driven world and a magical one. Sometimes they need horses-n-swords, other times it’s cars and tasers. So it’s okay for the heroine to look like a contemporary 20-something going to a business meeting with a sword, because at some point she probably does. I picked them for the front facing / backward facing model in the same series. Finding historical-looking people for fantasy covers is really difficult. I plan to persist, but am pretty sure compromises will be required. No wonder authors go for photo shoots and illustrators. If/when I can justify it financially, it will be all illustrators, all the way :-). Urban fantasy! That’s the word I was looking for! Back or front, she should face the text you are promoting — the reader will look at whatever she is looking at. That’s my first thought, and I came to the comment box to type it even before I finished the first paragraph, LOL. RE: Looking outward. In general, the cover is the first time your reader meets your character. If the cover says she looks like X, most readers are down for that. If in your text, your readers find she has red hair when the cover has black, then the readers will be mad at you, not the cover (at least, that’s how my mind works). The only exception I can think of is if the reader reads and remembers a huge excerpt at the back of your last book, and forms an idea before seeing the cover pic. With self-publishing, maybe you can add a low-res thumbnail of the character to the beginning of the sample? I’m not naturally a visual person, so I appreciate seeing the face and knowing what the characters (and the setting) looks like. I won’t hold a grudge for long if the traditionally published cover doesn’t match the contents. But I’m not sure about self-publishing. (-: Since the writer has final approval on the cover, I think I hold her to higher standards. Not seeing the characters’ faces doesn’t do much for me (unless it’s a really stylistically cool depiction that is art on its own terms), except maybe encourage me to open the book faster and find out who this person is. (In those cases, all the other cues — lighting, setting, colors, font and other design, and most particularly, the summary, title and author name — must tell me that this is the kind of book I’d like. Just one more thing before I read what everyone else says: I’ve read some Ilona Andrews, and I don’t like the French cover. It looks too medieval to me, and I don’t see much hint at all that it’s a modern story. Even the English cover is edging towards not-from-our-time, but the lapels on her jacket do a pretty good job of grounding the time period. I think you do want some medieval flair on the cover; it’s a very old-fashioned story in a lot of ways. But you also need something hinting that this is contemporary paranormal romance. 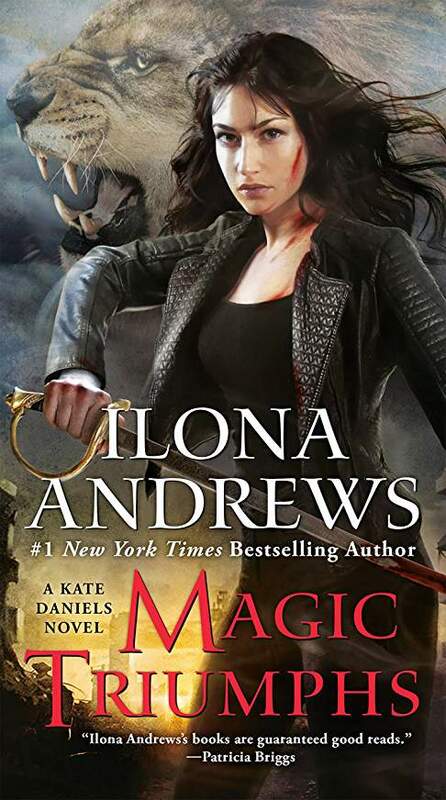 Unless, of course, you are able to sell books on the “Ilona Andrews” alone, you can get away with a lot on the covers. Maybe French people like that sort of thing.